If you are a scary movie fan and also a survivalist/prepper, you probably get just as frustrated at the dumb moves and cliched bad decisions most horror movie characters make as I do. I mean, they never flee or call the authorities at the first sign of trouble, they always investigate a noise or wander off alone or agree to split up. They’re never smart about weapon use and they only ever pack booze and fuzzy slippers for a weekend away at a secluded cabin in the woods where there is (conveniently) no cell phone service. No matter if the place is haunted, one of the group is psycho or there is an undead madman out for revenge on teenagers (for the seventh time,) survival is few and far between. “If only those kids had been better prepared,” you think, they would have been able to conquer the bad guy, demon or whatever else hunting or haunting them. Alas, people in horror movies are constantly making stupid mistakes—ones I know you would never make, right? But just to make sure you avoid these deadly mistakes, I’ve compiled this list of what you need to survive a night in the woods. As someone situationally aware and prepared for the worst, don’t horror movies frustrate you? My first words of advice are to NEVER GO INTO THE CREEPY FOREST in the first place! But if it is unavoidable, keep your wits about you and don’t forget these survival essentials. What do all scary movies have in common? They all take advantage of humans’ natural tendency to fear the dark. Like, why do ghosts only come out at night? Do knife-wielding mass murder maniacs who won’t die really sleep all day? Typically, the bad guy will expertly cut the electricity, or a storm causes it to go out. Either way, all scary things happen only when it’s dark. When there is still power, no one thinks to turn on the lights when entering a room or going down the basement stairs. The bad guy uses the dark to his advantage. With a good light, you can distract and even temporarily blind your would-be attacker, you can see what is in front of and around you. You can spot obstacles on the path and avoid them, so you don’t trip and break your ankle, making it possible for the slowest, but most determined psycho killer to catch up to you and hack you to bits. A headlamp allows you the use of your arms and hands—to climb, barricade, drive, dig, hold a weapon, fight…whatever you need to do. I like this super bright one made by UVER. Light up not just the night, but everything else with an 8,000 lumen headlamp. 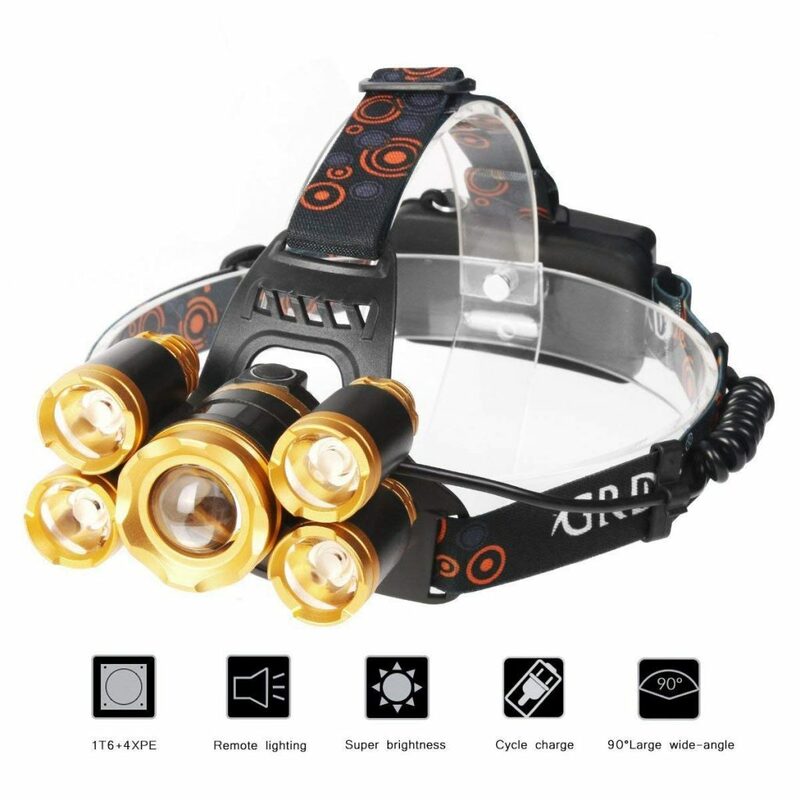 This 5 LED headlamp with a total of 8,000 retina-burning lumens, has a 1,640-foot range. The beam is adjustable from spotlight to flood and there are four modes to choose from including strobe, which is suggested when you need to create a high-tension scene that allows the bad guy to jump-scare you and your audience. The rechargeable batteries last from 8 to 10 hours on a full charge, so you’ll want a long-lasting light for back up. Check out the 32-day Ultimate Survival Technology survival/camping lantern. It won’t flicker out at the most inopportune time. On high, you get 700 lumens which will run that bright for 22 hours. Low is 30 lumens with a 29- to 32-day runtime. There is also a strobe and bonus SOS mode. No matter what, if you’re running away at a sprint from the bad guy who seems to be taking a leisurely stroll through the woods of which you are completely unfamiliar with, you will trip and fall, even when no obstacle is there, so sturdy shoes are a must! A correct-fitting shoe made for hiking prevents injuries of all sorts. Check out the best hiking boots and trail running shoes here. Any time you venture outside, you should take a partner, or at the very least tell someone exactly where you are going and when to expect you back. There is no need to hide in small, inescapable places when you can stay put and on guard with a thermal imager. Thermal imaging devices like binoculars or a monocular will let you see them before they see you, even in total darkness. You’ll see when they are coming and where they’re coming from, giving you the chance to put your best defenses in place. Click here to see our favorite budget thermal imaging monoculars. If thermal isn’t in your budget, check out our favorite affordable night vision devices. 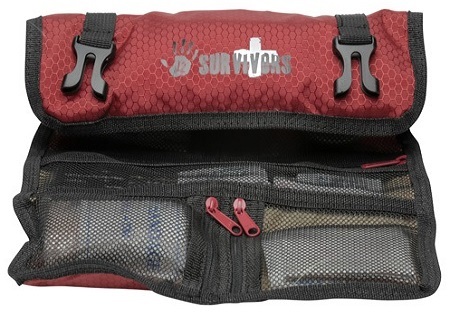 The 12 Survivors ultra lightweight first aid kit includes everything a hiker needs. When out in the woods, accidents happen. Your inexperienced or drunk friend will slip and fall or accidentally cut themselves trying to chop wood or one of them might fall ill with a really gross skin affliction. Either way, any time you venture outside for any activity, you need to have a first aid kit at the ready. Hikers, trekkers, backpackers and climbers need as lightweight gear as possible. We’re huge fans of the 12 Survivors lightweight kits designed especially for hiking. Click here for a list of our favorite lightweight first aid kits stocked with the necessary first aid supplies. Unless you’re Michael Myers, Jason Vorhees or Freddy Kruger, your gun at the knife fight will reign supreme, but in places you can’t have a gun, or a gun is something you oppose, you will still want something to defend yourself from even four-legged attackers. Pepper spray and a stun gun are the easiest of the non-gun self-defense tools to use without needing a lot of practice or strength to effectively stop a threat. Click the article below to read about alternative forms of self-defense. In real life, we are all rational enough to know there is no Necronomicon, no regenerative superhumans and no infamous serial killers possessing dolls. But we do know there are things out there that cause harm if we aren’t careful. That’s why as experienced and knowledgeable outdoorsmen and women, we go prepared! 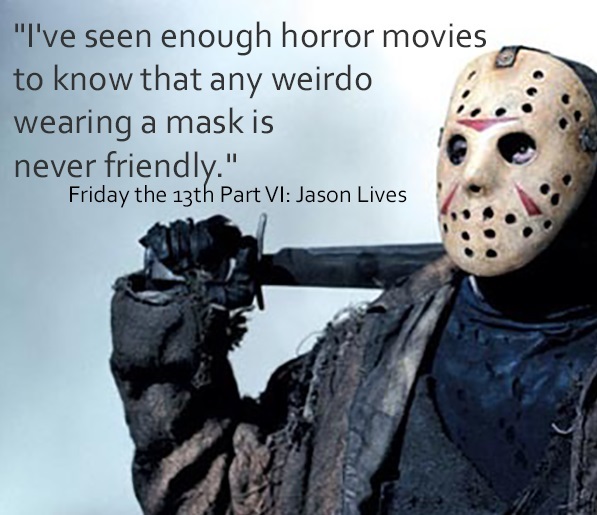 What has always annoyed you about the dumb things characters do in scary movies? Tell us in the comment section.